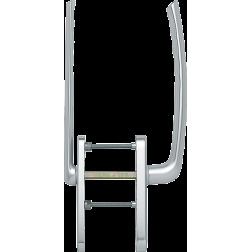 Pair of lift slide handles Hoppe Tokyo series with low profile, on rectangular plate with yale hole (cylinder hole). The Tokyo lift slide handle is made of alluminium, useful when there is little space available. Available in silver, titanium and white finishes. The mechanical structure is really durable and it is capable of lasting for a long time. Only one color available for this model.